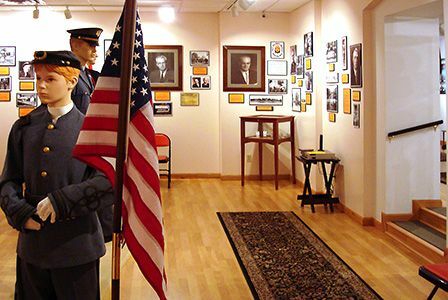 Located on first floor of the Dlesk Conference Center, the Linsly Museum was created to depict and preserve the history and the legacy of our school. The museum consists of three galleries. The first and largest gallery is devoted to the history of the school and is presented in 50-year segments from 1814 to the present. Mannequins are dressed in several styles of the school uniform, including those worn from the 1877 military period to the present "prep" school coat-and-tie. Display cases exhibit many artifacts and materials used by the school over the years. The second gallery features exhibits that supplement or expand the displays in the main gallery but which deserve additional attention because of their importance. Some of the displays include the Aviator Memorial, the Drum and Bugle Corps, and the Minstrel/Extravaganza. The third gallery is dedicated to the history of athletes at Linsly. Many student-athletes honored at the amateur and professional levels are featured. Also, OVAC Championship years are recorded from 1943 to the present. Many older trophies are displayed along with sport artifacts. Of course, no description of the school museum can do justice to the unique experience one has when viewing the displays. We encourage you to visit us soon. More photos of the museum.